At teamLab Borderless, visitors in darkened rooms immersed in borderless art filled with flowers, butterflies and streams of light in every color. From traditional woodblock prints and calligraphy to manga and digital butterflies, there's something for every taste. Whether you know a little or a lot about art, Tokyo is the perfect destination for those curious — or hungry to learn more. Traditional Japanese art forms include sculpture, ink painting and calligraphy, woodblock prints, origami and ceramics. Nezu Museum features a vast collection of over 7,400 pre-modern Japanese and East Asian artworks, including ancient Chinese bronze, ceramics, paintings and lacquerware. In a superb setting designed by the renowned Japanese architect Kuma Kengo, masterpieces are shown in exhibitions, each with different themes. Afterward, enjoy green matcha tea in the café, and take a quiet walk in the 180,000+ square-foot garden, with a rolling landscape of hills, trees and streams. To view stunning examples of Japanese and Chinese paintings and calligraphy once owned by royalty, visit the Museum of the Imperial Collections. The museum was borne of royal gifts – the Japanese Imperial family’s more than 6,000 treasured pieces, many of which created by in-house artists over generations, and can only be seen at this particular museum. History can come wrapped in a shiny, new package. For example, in 2016 the towering, angular, anodized aluminum Sumida Hokusai Museum opened, featuring the work of famed Edo-era artist Katsushika Hokusai, who died in 1849. Hokusai specialized in richly colored woodblock prints and paintings in the instantly recognizable style of ukiyo-e, depicting the pleasure of beautiful landscapes, beautiful city life – and beautiful people. Hokusai’s work “Under the Wave off Kanagawa, from the series Thirty-six Views of Mount Fuji” is a classic piece popular worldwide. New and old, East and West also come together in the National Museum of Western Art, designed by renowned Swiss-French architect Le Corbusier, and home to 4,500 paintings and sculptures from the last 500 years, from Monet, Van Gogh Renoir and Pollack. The exterior’s gardens contain Rodin sculptures, and the building is now a UNESCO World Heritage Site. Wearable art from silk kimonos to Louis Vuitton is displayed at The Textile Culture and Ukiyo-e Art Museum – Amuse Museum, where textile exhibits constantly rotate, so each visit rewards you with new views of 1500 items at a time. The (wearable) art of war is on display at The Samurai Museum, with more than 50 authentic pieces of armor, from helmets to swords. A sense of time travel may result from dressing up as a samurai or experiencing a sword show – both included with the price of admission. As does a visit to a kabuki theater, where dance-dramas have been performed by ensembles for hundreds of years. Kabukiza Theatre in the historic Ginza district was redesigned in 2013 with precise structural integrity, by top Japanese architect Kengo Kuma. Step beneath the dark, wide eaves and into the theater, the city’s principal venue enjoying a traditional performance art. Contemporary artists still work in forms such as painting and kabuki, but today, manga and anime animation forms are wildly popular across continents and generations. The Ghibli Museum features the world-famous Japanese studio’s art, including exploration of founder Hayao Miyazaki’s approach to animation, featuring renowned characters such as Totoro. The design institute 21_21 Design Sight is directed by designer Issey Miyake, graphic designer Taku Satoh and products designer Naoto Fukasawa. The architect is Tadao Ando. Three gallery spaces focus on the aesthetics of everyday things and events – you may come away with a new appreciation for the function and pleasure of design in our daily life. Then, board a spaceship (of sorts) to view an ever-changing collection of Japanese and European exhibits at the oh-so-futuristic National Art Center, Tokyo. Temporary exhibits include free options on the second and third floors, and ticketed, more exclusive exhibits, ranging from 20th-century European paintings to serialized Japanese manga. More contemporary pan-Asian works are on display in the glass-enclosed Mori Art Museum, in the upscale Roppongi Hills neighborhood, a planned urban community for shopping, living and working. Featuring ever-changing artist exhibitions and solo shows by up-and-coming artists, the museum’s modern approach suits its here-and-now setting. 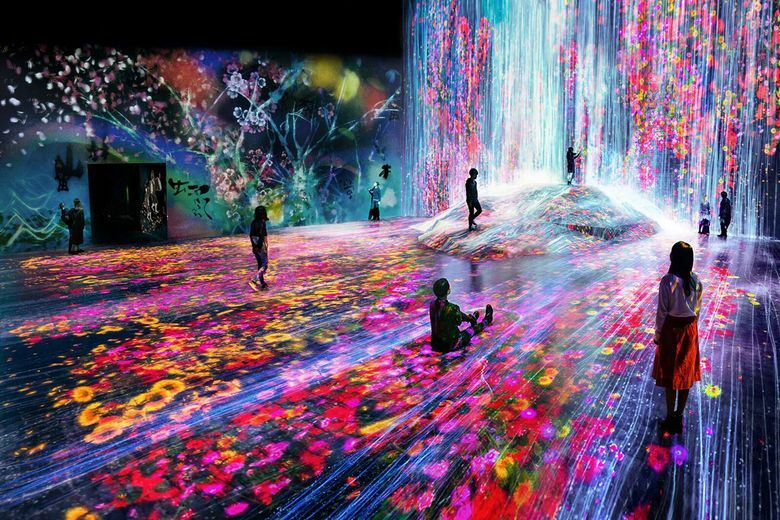 One of Tokyo’s newest museums (2018) offers a digital art experience – teamLab Borderless is a museum where 520 computers and 470 projectors beam interactive art into a 107,000-square-foot space. In darkened rooms, visitors are surrounded by and immersed in borderless art filled with flowers, butterflies and streams of light in every color. Galleries throughout Tokyo sell traditional and modern pieces in every medium, so a suitable souvenir may be a vibrant woodcut print or contemporary painting from a gallery. Galleries are scattered around the city, although a sizable number of contemporary shops are in the Minato neighborhood. The blog and book “Art Space Tokyo” can give pointers on where to go. Alternately, sign up for an art class, and learn some of the masters’ techniques. A hands-on workshop in Japanese calligraphy, painting, bonsai or ceramics enables to tote your own treasure home – a souvenir made with love, in Japan. If you can’t fit art in your suitcase, that’s okay – your new, brainy art-smart knowledge won’t require a trip on the baggage carousel. The Tokyo Convention & Visitors Bureau works to provide the best “Tokyo experience” for every visitor, every time they visit, by uncovering and developing Tokyo’s enduring charms.